Kale and lentil salad packs a powerful punch of protein. 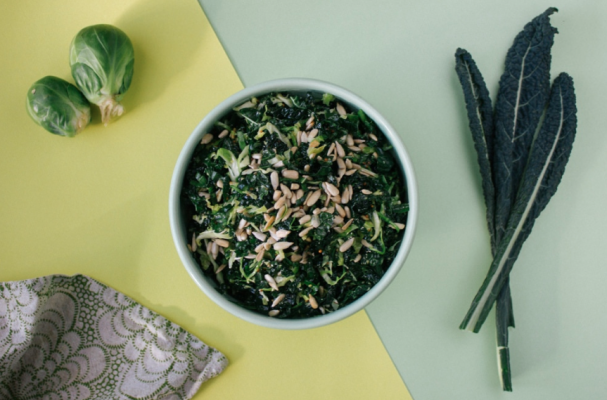 Since this salad uses a variety of sturdy greens like kale and cabbage, you can prepare this healthy meal (even with the dressing) ahead of time and enjoy for lunch or dinner. I suggesting cooking the lentils the night before to make putting this salad together that much easier. I like to make this salad and store it in individual portions in mason jars. Also, if I am looking to boost the protein, I'll serve this salad with a roasted salon filet or a grilled chicken breast. Step 1: In a mixing bowl, whisk together the yogurt, dill, minced garlic, lemon juice and olive oil until well combined. Season with salt and pepper. Set aside. Step 2: In a large bowl, combine the kale, cabbage and broccoli. Add half of the dressing and toss until the leaves are well coated. Top the salad with the lentils, ricotta salata, hemp seeds and sunflower seeds. You can add the reserved dressing at this point or save it until just before serving. Store in the fridge until you are ready to serve.